Christian Horner was the first of a new breed of young, enthusiastic team principals and during his time in charge at Red Bull he has built up his power and influence within the sport. He started out as a driver in 1994, competing in the British F3 championship with three different teams in the space of three seasons. In 1997 he moved into F3000 and founded Team Arden. After realising he would not make it to the top level he retired from driving at the end of the 1998 season to concentrate on team management. At just 25 years old, Horner initially struggled for results with his fledgling team. However, in 2002 he signed Tomas Enge and Bjorn Wirdheim and Enge went on to finish first in the championship, only to be demoted to third after failing a drugs test. Wirdheim remained with the team the following year and went on to win the title by a massive 35 points. 2004 was Arden and Horner's glory year. He signed Tonio Liuzzi and Robert Doornbos and the team secured the constructors' championship by a huge margin with Liuzzi taking the drivers' title. 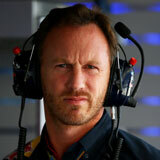 When Red Bull entered F1 in 2005 they set about finding a young, dynamic team leader and Horner was an obvious choice. When he joined F1, aged just 32, he was by far the youngest team principal and the media were quick to attack the appointment, ignoring the fact that both Frank Williams and Ron Dennis were a similar age when they started their F1 careers. It took Horner just over a season to secure the team's first podium at the 2006 Monaco Grand Prix. Before the race he promised that should a Red Bull finish in the top three, he would take a dip in the Energy Station's pool in his birthday suit - and true to his word he kept his promise, albeit dressed in a superman cape. Older and wiser, Horner led the team to four consecutive constructors' and drivers' titles between 2010 and 2013, with the appointment of Adrian Newey as technical director proving to be an inspired decision. With its success, Horner has also built Red Bull's political standing within the sport and enjoys a close relationship with F1 supremo Bernie Ecclestone.